Many users have a bad habit of filling the desktop with what they download or documents they are no longer working on, in such a way that after few days it is practically impossible to find anything without it taking some time. 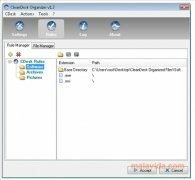 CleanDesk Organizer is a program that has been designed to make the desktop automatically organizes itself with a click of the mouse, storing the images, songs, executable and video files in independent folders, so as to organize them. To configure the application you should assign a series of rules that indicates the kind of files that have to go to each folder, you will also have the possibility to program automatic desktop organizing, that will take place every few days. The interface of this practical application is rather simple and intuitive, something that makes it very easy to create rules and to handle all the functions that it includes. In the system tray you will have access to a program from which to launch the desktop cleaning process. Download CleanDesk Organizer and no longer have a disorganized desktop.